If you have preconceived ideas of what kind of heavy metal that should come out of Gothenburg or Sweden general, then Zero Illusions and their debut Enter Eternity will probably throw you for a spin. This is neither some derivative of death metal or power metal, but rather solid traditional heavy metal with a modern flair. Enter Eternity builds upon a strong modern motif of creative riffs and chord development, but that's where it ends. There's no screamo, death or growling vocals, blastbeats, or breakdowns to found here. In reality, the lead vocals of Bjorn Asking and the accompanying vocal arrangements are likely the most entertaining feature of this work. 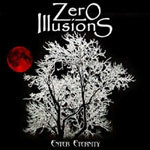 Zero Illusions easily blends the modern touch with the classic elements of melody and heaviness. Sometimes their compositions tinker with melodic hard rock as on Am I Too Old or Like Yourself, but the inherent heaviness could easily beg the question. However, the modern nuances still present a problem as the first six songs focus almost entirely on riff development to the exclusion of guitar solos (excepting the fine Face Of Fortune). The vocal arrangements and the tight rhythm section are the true stars in the first half of this platter. The best stuff comes later on Enter Eternity where, pushed along by the modern motif, the classic elements melodic heavy metal leap to fore with exciting results. Like Yourself, What Remains and the magnificent near progressive metal, Left Alone are true delights which move with metal passion and progression. Zero Illusions's debut, Enter Eternity, is not your typical Swedish death or power metal. Rather, Zero Illusions uses modern elements to undergird and promote classic melodic heavy metal for clever and entertaining results. Quite recommended! Zero Illusions's debut, Enter Eternity, is not your typical Swedish death or power metal. Rather, Zero Illusions uses modern elements to undergird and promote classic melodic heavy metal for clever and entertaining results.